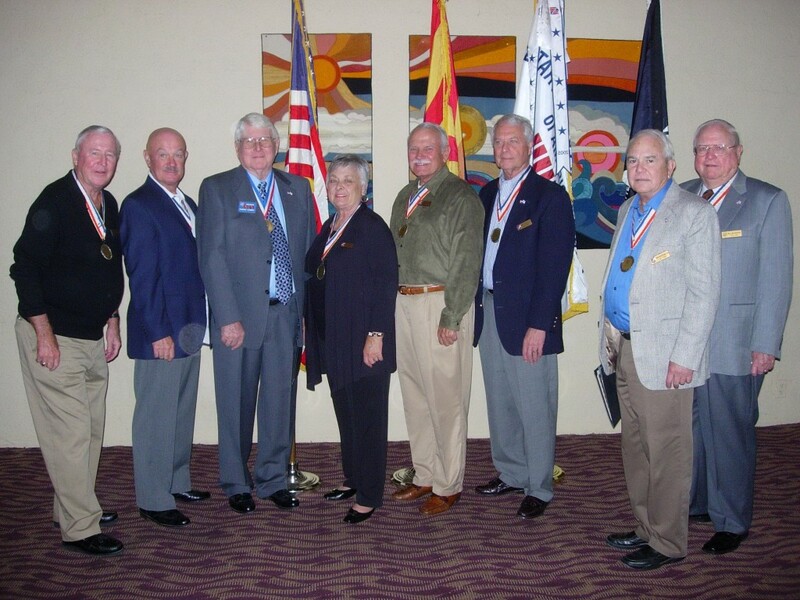 At the 20 November 2010 luncheon meeting, Chapter MSAs were awarded to eleven members of the Arizona Chapter for superior service to the Chapter and its members. Recipients from left to right: Col Pat Dale, USAF Ret. ; Col Rob Welch, USA Ret. ; CAPT Dan Conway, USCG Ret. ; Mrs. Marie Fredricks; LCDR Terry Tassin, USN Ret. ; Col Gary Fredricks, USAF Ret. ; Col Ron Worthington, USAF Ret. ; COL Bill Roscher, USA Ret. Not shown are COL John Ady, USA Ret., Mrs. Beth Cullison and LtCol Jim Cullison, USAF Ret.